The Peel app showed that the carrier has a strong effect on the peel behaviour. But that assumes that the carrier itself does not plastically deform. If it does, you measure a peel value that includes the work going into the stretching of the carrier. To avoid this, the carrier thickness should be greater than a critical value, tc which depends on the peel force, P, the modulus E and the tensile strength (i.e. when it starts to plastically deform) σ, examples of which are listed below. If your carrier thickness is greater than tc then you're OK. If not, then check carefully after each test to see if the carrier has been significantly deformed by the test. What is less well-known is that in many peel measurements P is very much greater than W. A good example is on p196 of the Lacombe book. Careful measurements of the peel strength of a polyimide (PI) adhered to aluminium (Al) gives values of 625J/m2 when measured by pulling the PI from the Al and 847J/m2 when pulling the Al from the PI. In other words, if you believed the numbers, the peel strength for the same bond is either 625 or 847J/m2. But in this particular experiment they were able to measure (by adding some calorimetry data) the "true" value of W which was 323J/m2 from the PI peel and 5J/m2 from the Al peel. In other words, depending on which experiment you do, W is somewhere between 5 and 847J/m2. What is the cause of this huge variation? 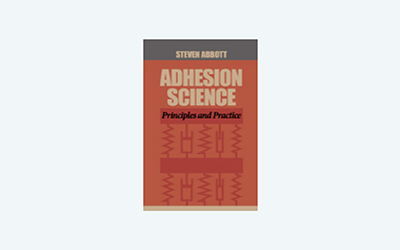 It is the assumption that the pulling apart only absorbs energy due to the breaking of the adhesive bond. In reality, the majority of the work is going into plastic flow of whatever is being pulled - the PI (quite a lot of plastic flow) or the Al (even more plastic flow). Another example on p210 shows that for two polyester strips weakly bound together, the peel strength can be precisely (but not accurately!) measured as somewhere between 4 and 600J/m2, again because a lot of plastic flow is taking place when the high values are found. The message from this is that if you want to know the true value of W you need to be certain that no energy is going into plastic flow. But how can you tell? The book shows two ways. The first is a complicated calorimeter than none of us will use in practice. The second is a simple rule (p216) which says that if the thickness of whatever you are peeling is greater than a critical value, tc then the measurement will not include a significant contribution from plastic deformation. where: E is the modulus of the peel material, P is the measured peel force/width and σ is the yield stress of the peel strip material. You can quickly calculated tc for your own system. If your peel strip is thicker than tc then your value of W (from P) is valid. If it is thinner then you have to do a full elastic/plastic analysis of your peel data in order to extract the true value of W. In the book the example is of 10μm Cu being peeled at 100N/m from a circuit board. Given its modulus of 110GPa and a yield stress of 70MPa (the default values when you first start this app) the calculation shows that you need a strip of ~6.7mm thickness to avoid plastic deformation, so the data from the 10μm is going to tell you rather little about W.
Note: Polymers can have rather more elastic recovery than metals (for which the formula is designed) so if you are thinner than tc your W value may not be too far off. However, the point is that if you are above tc you are safe, so the calculation is still insightful and the further you are below tc the less accurate W will prove to be.